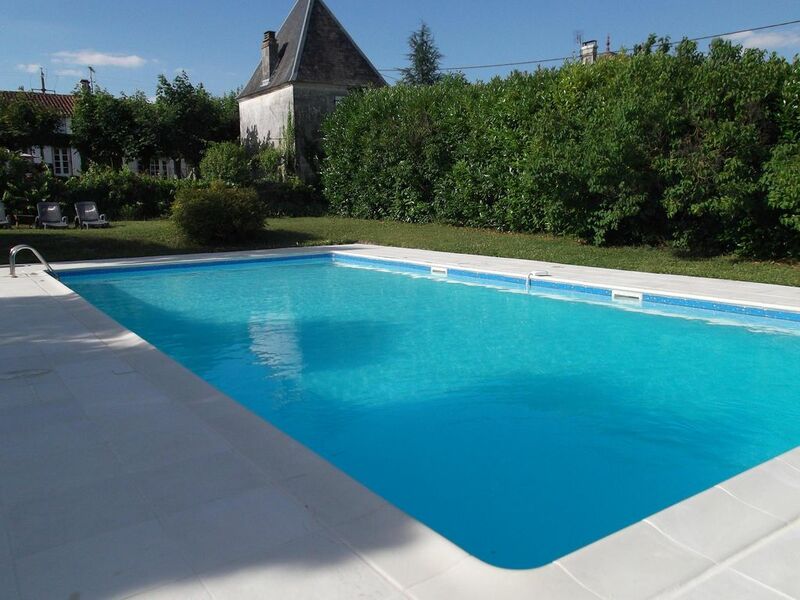 18th Century Cognac Farm surrounded by the Vines of the "Grande Champagne"
Enjoy your holiday in a beautiful farmhouse with private pool, between Angouleme and Cognac. Our house is a renovated 18th century cognac farmhouse offering spacious, comfortable family accommodation to enjoy both outside or inside living. Secluded gardens providing sun and shade or the large orchard with astonishing view over the vines will guarantee a fantastic holiday experience. Take a swim in the private pool (12m x 7m) which is alarmed for children's safety. Brand new garden furniture, barbecues and sun loungers are available. A short walk through the vines will lead you to a welcoming pub/restaurant in the nearby village. Local markets, historic towns and cities like Angoulème and Cognac are nearby. Walk or cycle beside river Charente or visit the famous cognac houses. Excellent golf at Cognac (20 km) and Angouleme (30 km). The nearest Airport is Bordeaux at 80 km. Hello, We are Koen and Ine and we live in Belgium. In 2011 we fell in love with this beautiful region of France. Since we love the good life, great climate, great wines and cognac, this area is just perfect. We fell in love with this beautiful region of France. Since we love wine and the warm climate, this area is just perfect. The setting within the vines of the Grande Champagne, used for the Cognac, provides astonishing views. The house is a former cognac farm, and still has the original cuves in the barn. Enjoy the sunset in our orchard! The house has 2 bathrooms,1 upstairs with shower and bath. 1 downstairs with large shower. 3 toilets (2 separate, 1 in shower room). plenty of parking space on the driveway and you can also park 2 cars inside the main gate (covered). One set per guest: washcloth, towel, bath towel and pool towel. Two lounge rooms with ample space for 9 persons, satellite TV and log fire with views over the garden. a limited set of tablets is provided to start. Our brand new kitchen looks great! The kitchen is extended up to 40m² and is equiped with a magnificent falcon induction coocker, 2 combi fridges, dishwasher, washing machine, if you love to cook (as we do), you'll love it! flat screen TV inn lounge room. A whole closet with dutch and english books. Pool toys are available in the pigeonier (tower building). Secluded gardens providing sun and shade, large orchard, beautiful sinsets, 100% private and secured pool (12m x 7m). 2 garden tables, 8 sun loungers. Kayak renting in Jarnac (15 min drive) on the river Charente. Excellent golf at Cognac (20 km) and Angouleme (30 km). Beautiful pool 12 x 7m with child alarm. The pool and house is 100% private! free wifi Do you wish to have dinner at your arrival, let us know. We can arrange a 2 or 3 course dinner. Price on demand. Six of us stayed here for a week - the accommodation is comfortable and clean and the kitchen better stocked than mine at home! The pool is excellent and private and we enjoyed making the most of what was a perfect week weatherwise. This is a great bolthole for those wanting a well-placed escape and once the gate is shut behind you, the courtyard is a little oasis. The house is on the main road, but traffic is not too busy and this didn't spoil the experience. We recommend this house to anyone wanting a home from home escape to this beautiful part of France. We thoroughly enjoyed our time here! The house is amazing and so are the grounds, Koen & Ine were very accommodating prior to our arrival & then David was on hand once we were there if we had any questions. The house was superb with lots of space to unwind & relax - we were a family of 4 and we had our friends stay here too (2 adults & a toddler) and there was plenty of space for us all plus extra! The pool is fantastic and clean and there were all of the facilities that we required. Highly recommend! We stayed in the Logis de Renaudes in December 2015. It is furnished and decorated very nice. Although it is a large house, there are plenty of cosy corners where you can have some privacy when you stay there with a lot of people. All the rooms and bath rooms are very clean. The kitchen is equipped very well. In the kitchen there is a large table which invites to cook, eat, “meet and greet”. The living rooms make you feel at home. As we went in December, the fire place insured a warm cosiness. We can’t give any comment on the swimmingpool because we didn’t use it (December). Although it was Christmas time, we had very nice weather: from 15 till 19 degrees. We enjoyed the garden as it was lovely with the winter sun. The garden swing was perfect to relax! The owners left a lot of information of the region. We went for several walks in the environment. It is a very nice region where it can be so quiet. We also visited Angoulemes and Cognac. We drank a lot of “pineau de Charentes” and visited (while tasting) the cognac farm of Duluc a few kilometers away. When you want to visit Duluc, you ‘d better call them first to be sure they hear the door bell ringing. One thing is for sure: we go back to Logis de Renaudes. It’s heaven on earth. A lovely relaxed and well equipped farmhouse. This is a lovely property and worked well for us as two families. The kitchen was large and well equipped with a lovely view over the garden. We enjoyed lunches and dinners outside in the garden and we also thoroughly enjoyed swimming and playing in the large pool. We went with 4 children from 2-8 years who all enjoyed themselves and this meant that the adults could relax too. We explored the local area with the help of the information provided by the owners and would certainly consider staying in this property again. Een zalig vakantiegevoel overvalt je bij het betreden van het domein. We hebben met ons negen, twee families, enorm genoten van de mooie boerderij, de prachtige tuin,het grote zwembad en de zalige rust tussen de wijngaarden en de zonnebloemen. Nearest beach is in Royan (1 hour drive). Airports Bordeaux (80km), La Rochelle, Poitiers, Bergerac, Limoges and Angouleme (40km). There are many distilleries in the area, worth a visit if you would like to taste some great Pineau de Charentes or Cognac! In Touzac, 10 min walk from our house, you can find a pub/restaurant, where Murielle and André will give you a warm welcome (english fluently spoken). PAYMENT: The reservation will be definitive after we have received a reservation deposit of 400€. A payment equal to the remaining balance is required 30 days before arrival. A security/damage deposit of 400€ is required and must be received within 21days of booking the property. The deposit is refundable within fourteen days of departure, provided the following provisions are met: •No damage is done to property or its contents, beyond normal wear and tear. •No charges are incurred due to illegal activity, pets or collection of rents or services rendered during the stay. •All debris, rubbish and discards are placed in rubbish bin, and soiled dishes are placed in the dishwasher and cleaned. •All keys are left and house is left locked. •All charges accrued during the stay are paid prior to departure. •No linens are lost or damaged. •The renter is not evicted by the owner (or representative) or the local law enforcement. If however the deposit is not sufficient to cover the damage, the tenant will be engaged to pay the amount required. Changeover Day: Changeover day is Saturday, we ask our guests to leave at 10am, and check in as from 4pm. This is a NON SMOKING property. MAXIMUM OCCUPANCY: The maximum number of guests is limited to nine (9) persons. An additional charge or 10€ per person per night for guests in addition to nine will be assessed. The tenant will enjoy his tenancy in a peaceful way and make use of it according to its determination: Holiday home. The tenant is engaged to leave the holiday home on his departure, as tidy as he found it on his arrival. ADDITIONAL FEES: Weekly linen&towel is included, as well as cleaning at the end of the stay. Water is included. Electricity is included but limited to 5 Kw/day, which is sufficient for a normal use of equipment placed at your disposal. In the case of excess, the supplementary Kw will be charged to you at the normal electric price. We recommend you take out travel insurance for your trip.